What is The Urban Co-Op? The Urban Co-Op is proud to be the first co-operative grocery store in Limerick - owned, controlled and operated by its members. We sell wholesome food at affordable prices and are operated by the community for the community. Our aim is to create a sustainable Limerick and we invite you to join us in making that a reality - The Urban Co-Op membership is open to everyone! Initially, we began operating in July 2013 as a Buying Club, selling fruit and vegetables, bread and eggs. At present we have over 400 members and are quickly transitioning to a full service retail grocery store. Our product range has expanded to include non-perishable goods. As a member of The Urban Co-Op you can shop for local produce, support local producers, be part of a growing food co-operative and enjoy building a great community project contributing to a sustainable Limerick! Where is The Urban Co-Op? Our new premises is at Tait House, Roxboro Road, Limerick. Join online to receive our newsletter and keep up to date with developments. When can you shop at The Urban Co-Op? 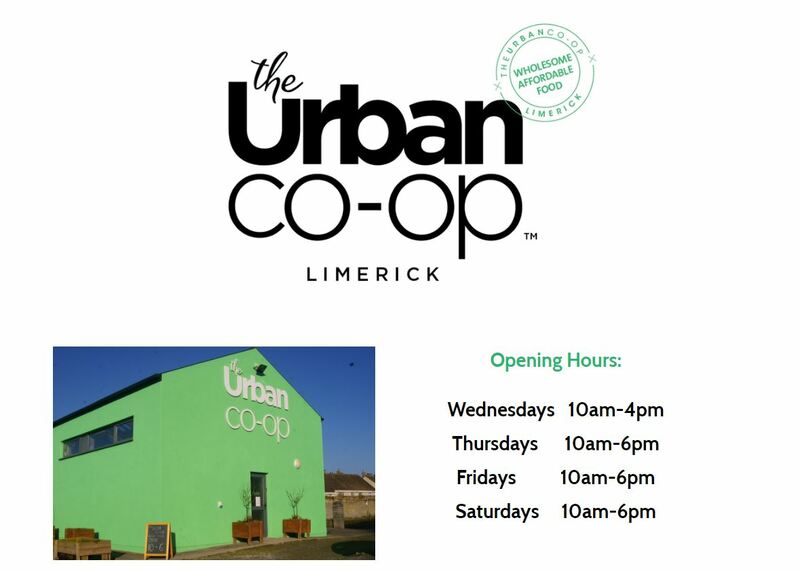 To shop at The Urban Co-Op you must be a member - membership is available for as little as €1 and can be purchased at the store or online. What is The Co-operative Model? The essence of the co-operative model is that the business is owned by and run for the benefit of its members (rather than directors and shareholders). Membership is made up of both the consumers who shop there and the workers who work there. Membership is open to all. Be a community grocery store, selling to its members. Sell wholesome food at affordable prices. Provide maximum transparency to members. Give equal ownership rights for all members. See more at About Co-operatives. A good introduction to Co-Ops is the Unicorn video. All members should be aware that they are collectively involved in a socio-economic experiment; the first of its kind in Limerick.